Last weekend, Eudice Chong ’18 and the rest of Wesleyan’s tennis teams competed at the MIT Invitational in Cambridge, Mass. 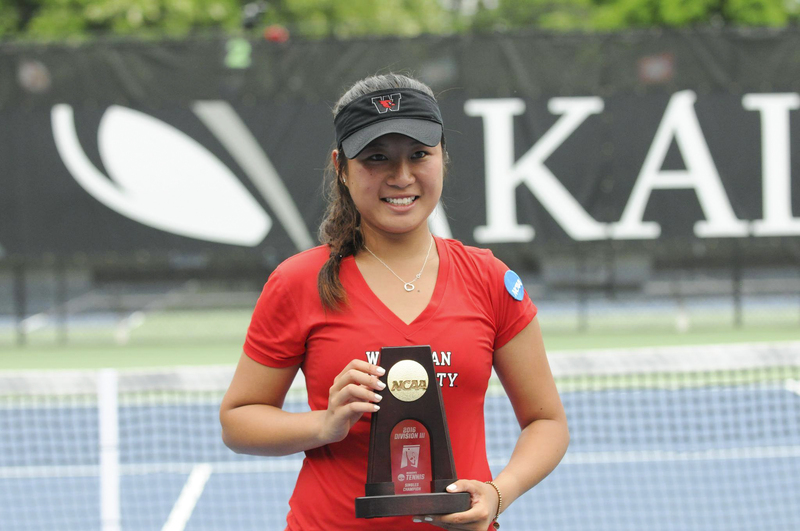 Chong, the NCAA singles champion for the last three years, came away with a tourney win in doubles with her partner Victoria Yu ’19, with whom she won the NCAA doubles championship with last season. The Argus sat down with Eudice to talk about tennis, her motivations, and her future on the court. The Argus: Congratulations on doubles victory at the MIT Invitational—what did you work on and try to improve at the tournament? Eudice Chong ’18: Well, the nice part is that I didn’t actually have to play singles at that tournament, so I kinda just concentrated on doubles—it was nice to concentrate on doubles and have time to work on it. Having played together with Vicky [Yu] last season, it’s kinda nice to get back into it. And we kinda had some practices before MIT tournament, so we could practice our doubles and get back into what we had last season. A: Can you capture your doubles victory at the MIT Invite in three words? EC: I’d say, ‘Team before myself,’ because, for me, I always play better when I know there’s someone else on the court with me, or if I’m playing for other people on a team and it’s not just myself. EC: I started playing tennis because my parents played it when they were young, and they’ve been playing ever since I was a kid, and I just grew up being around tennis courts and the clubs. For me, I actually hated tennis in the beginning—I absolutely hated it—because I’d always do private lessons with my coach and I just wouldn’t run, but then I started swimming, and I gained a lot of weight, so then I think I was 11 and then I started playing more with group settings and with more kids, and so I liked it a lot more, and it helped me lose weight. (She laughs.) Tennis is part of my life, it’s always been in the shadows, even when I didn’t play, so it’s kind of something I’ve always known—something comfortable for me. A: We all know how exhausting and frustrating tennis is. What makes you tick, what makes you keep going on court? EC: Well I guess for me, something that I always think about and something that Coach Fried always reminds: “Do something that makes you better 1 percent every day.” And that’s something that I kind of keep in mind. And knowing that I can get better, even if it’s just by a little bit, makes me work harder, and that I can be improving every day. A: Why do you want to improve? EC: A lot of it is ‘cause I am thinking about playing on the tour after college, after I graduate, and I know that in order to do that I have to push myself here and get ready in advance for doing that. And also definitely for the team, [I want to] be a good role model, as the captain, to the freshmen and everyone else on the team, knowing that even if practices are tough, days are tough, everyone has to be there, to work hard, to get better, as a team. A: Why are you a better player than everyone else in Division III tennis? EC: (Laughs) I don’t know how talented I am, but I think that I definitely got a lot of good coaching, I’d say, when I was younger; I had a variety of coaches that kind of helped me develop my game into who I am today. And I wouldn’t say I’m more talented, I wouldn’t say I work harder than anyone else either, but I think for myself, I try to work as hard as I can; I don’t know if that makes me a better player. I think a lot of it also comes from a lot of experience, from traveling, because I played a lot of junior tournaments growing up, like ITFs [International Tennis Federation tournaments], and that has helped me see a lot of different people and how they play, and I guess that experience kinda helps me become [the tennis player that I am] on court here. A: Why did you choose to come to Wesleyan, as opposed to a Division I school? EC: I actually wasn’t looking at any DIII [Division III] schools when I first started looking for colleges, but I guess one of the bigger things that I thought would really suit me was that I could get a really good education as well as play tennis, and I think going to a DI school a lot of the time [wouldn’t] give me that. Going to a DIII school helps me have the full college experience, compared to if I went to a DI, everything [would be] so centered around tennis and training and traveling, that I don’t really have a good chance to see everything else that happens on campus, meet new people, you know? So that’s pretty much why I came to a DIII school, and for Wesleyan specifically, I guess, because, mostly for the teammates that I have—[they’re] all very amazing. We have great camaraderie between us. And Coach Fried, obviously, he’s been a big part of the whole experience. And coming in, I knew I’d have to spend four years with the same group of people and the same coach and that if I didn’t like them, that’d make my experience more miserable. A: When you play, do you prefer to acknowledge and embrace pressure in tennis, or do you try to ignore it and focus on yourself? EC: A combination of both, I think. If I know that there is a lot of pressure on me, I use that as motivation to play better and know that people are depending on me, and I have to perform well. But at the same time, I kind of have to push the pressure thing to the back of my head when I do play, ‘cause I’ll get really tight and kinda think about it too much. I think before a match I absorb all the pressure, but then during it, I’m just like, “Okay, leave that aside,” and just perform how I should perform and not let anything affect me. A: Can you realistically assess your chances of success on the pro tour? EC: I did have a really good summer before this, playing tournaments, so I got a little taste of playing more full-time and actually traveling a lot and training. I think that kinda helped me see where my level stands compared to other players, and I think if I do manage to train well and take care of my body and do well in tournaments, I could have pretty good success I’d say, but I’m not trying to look into the future too much, just try and concentrate on what I have now. But I guess I definitely do have goals, kind of like where I want to be in a couple years after college. A: What would be your pro dream? EC: Definitely the Grand Slams—I’ve been to the US Open to watch; it’s very cool to go and see it as a spectator, but I’m sure it’d be more amazing if I was actually a player there playing. So definitely I’d say the Grand Slams. And then it’s always an honor to represent my country (Hong Kong) as well, playing for Fed Cup, and a couple different bigger tournaments like Asian Games, like University Games. So that’s always very cool too, so hopefully I’ll keep that up. A: Anything else to add, anyone to thank? EC: Definitely my parents, definitely a lot, because they’ve been supporting me since I was really young. Chong will be playing next on Friday, September 29 at the ITA New England Regional Championships, hosted by Williams.